Libraries are changing and even thriving. 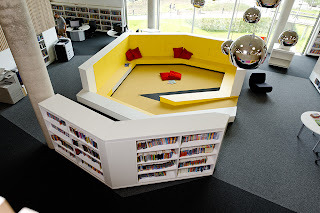 I’ve just been looking at pictures of Worcestershire’s award winning, £60 million library and history centre, The Hive. They show a lot about some of the trends happening today. The first of these is co-location, where the library shares a building with another body. 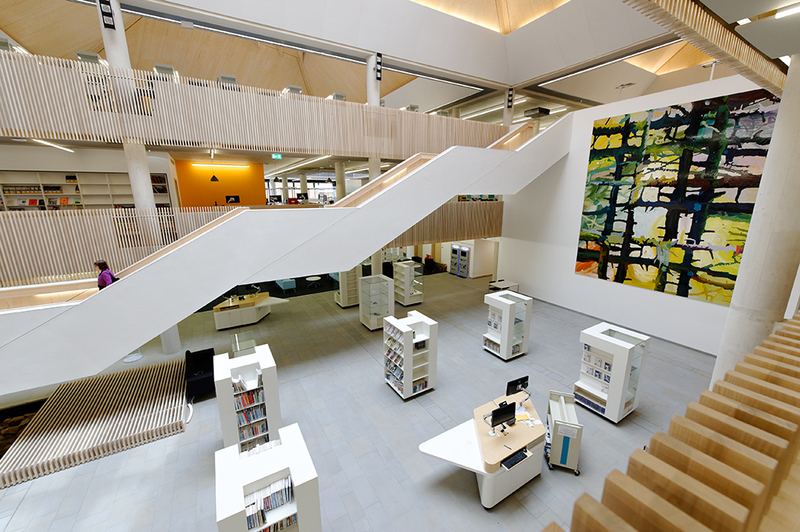 The Hive is the first UK example of a fully integrated building shared between a public library (Worcestershire County Council) and higher education (University of Worcester). A university is of course an especially grand example. Other cases include obvious partnerships like one stop shops with other council services. More odd examples include florists, pharmacies and even the Co-op. Co-location has big benefits for both parties: the costs of the building are shared (perhaps a third of total annual costs) and both party benefits from footfall generated by the other. 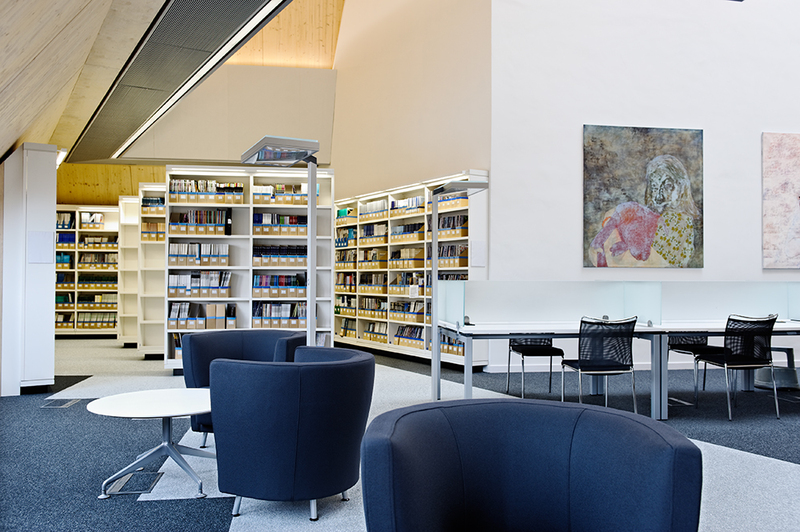 There’s another trend in new public libraries exemplified by the big spaces and big paintings in the pictures. This is grandeur. Seemingly completely at odds with the austerity of current times, there are a few reasons for this but I will include only an official one and a less official one. The official one is that big in-your-face libraries like The Hive are, excuse the pun, honeypots for attracting people into an area. Put simply, people want to live near big libraries and they thus boost housing prices and other things. The unofficial one is that almost all of these projects started before the recessions. The great new library still being completed at Birmingham, the wonderful Canada Water Library and the major refurbishments at Liverpool and Manchester would never have got off the ground now. Ed Vaizey will still claim the credit for them but they are nothing to do him. They are the reminders of happier days. There’s a down side of even this, though. With 27% cuts already announced to councils and a further 20% rumoured to come, these wonderful new buildings run the risk of being big white elephants at the worst and the constant number-one claim to library cash. This is not wonderful for people without easy access to them, as Brent has found out. It also precisely those people who need libraries most that will find it hardest to afford the bus fares, or time, to get to the swanky figurehead library two bus journeys away. There’s another big trend being shown as well. This is libraries as meeting places. Quite rightly, it is acknowledged that public libraries play a highly important role in being welcoming neutral spaces in the heart of the town or, in smaller branches, at the heart of their communities. This has been common knowledge for librarians for quite a while but the public, and policy-makers, have finally woken up to the death of “shhhh”. In the better, bigger, branches, there will still be quiet study areas but libraries are no longer, for good or ill, being seen as silent sanctuaries. Then, finally, there’s the big trend that authorities are careful not to boast about. These places often have less books. There are very good reasons for this. In the age of online resources, there’s less of a need for massive archives. New libraries also represent a great time to get rid of old stock as Manchester has, controversially, shown. Also, if libraries are going to be community meeting spaces and figureheads for communities, there’s less space and less priority on that thing which made libraries necessary in the first place. This can be seen as good or bad, depending on one’s view. There’s doubtless another trend that the Hive shows as well. I bet it has more computers than its ancestors. This ties in with contemporary trends but … I wonder. I’m guessing that with the increasing use of smartphones, it will be less necessary for banks and banks of computers. Like the dependence on tubchairs, rows of PCs may perhaps be seen as a relic of older days in the not too distant future. Wifi, which is of course hard to show in these photographs, is most definitely as well a trend notable in public libraries, although less than it should be due to the lack of money for its installation. So we see that new libraries are still being built but it’s clear that they are changing with the times. These changes will be welcomed by some and less welcomed by others but it is at least great to see that some thriving is still going on. But it is going on despite of, and not because of, current national policies. Print article This entry was posted by Ian Anstice on July 19, 2012 at 8:35 pm, and is filed under Uncategorized. Follow any responses to this post through RSS 2.0. You can skip to the end and leave a response. Pinging is currently not allowed. 1. A *lot* of PCs. All with big screens, higher end kit. No Macs, though. 2. It’s very Nordic in design, lighting and arrangement inside. Reminded me of several libraries in Sweden and Finland. 3. It’s brand new; everything sparkling. Many staff, all positive. 4. The roof was leaking. 5. Difficult to quantify the number of books. Quite a few, with lots of empty shelf space to expand. The special collections area was sparse, though. 6. I didn’t have any formal ID, but still (with no hassle) got a day pass for the Internet. This is good. 7. What was *really* good was the opening hours – another plus of combining a public and academic library. It’s open 8:30 to 22:00 … seven days a week. 8. Because it was summer, with most students away, reckon it was relatively quiet. Most of the people on the PCs were eastern European workers on Facebook (and no, not judging though imagining Daily M@ail reading types will). 9. Nice coffee in the cafe. And the shop was the only library one where Worcestershire Sauce was for sale. My school was two miles away. Those who were were bright, studied, got good grades went on to college and university. Those who didn’t went to work in the Lea and Perrins factory making it. 10. A games area, with playstations hooked up with various games. Popular with groups. Thanks for this excellent comment. I’m not allowed by my family to go on enough day trips to visit nice new libraries myself. The wife whispers darkly words like “obsession” and “divorce”. Can only assume they are the names of two perfumes, one successful and the other … um … less so. Services sharing buildings can be a positive thing if it keeps libraries open but there are real dangers in merging rather than co-locating services within buildings. Library users having to queue up behind people waiting to be seen for other queries – often of a sensitive or confidential nature, library buildings and staff managed by managers who have no real understanding of the library ethos, opening hours altered to suit the other service as well as to cut costs, professional posts lost, narrowed or downgraded, the library offer becoming an adjunct to the other service, library assistants becoming receptionists, no specialist services in reference,av, children’s or bibliographical services because new management can’t see their importance … Speaking from experience? Yes sadly I am. Feel confident that my authority will have librarians and a library service in five years time? No. Have book exchanges? Yes. So perhaps that is the trade off – at least the books will remain. Sorry to be so miserable after such a positive post from you Ian – bad day! I thought I would go with something brighter than the normal relentless procession of depression and then you go and spoil it all 🙂 You’re quite right that co-location brings its own dangers as well as opportunities. Nothing in this world is black and white any more.